This rice is, Sooooo tasty, it’s simply bursting with flavors. It does taste fairly sweet and the textures are just all over the place. I especially liked the fresh flavor of curry leaves, Paired with the creaminess of the squash and bell peppers adds crunchiness to the rice, it was a definite winning combination. Wash and soak rice for 30minutes. After soaking time drain and set aside. Boil enough water in a sauce pan, add salt, soaked, drained rice and cook for 18-20minutes or until fluffy. 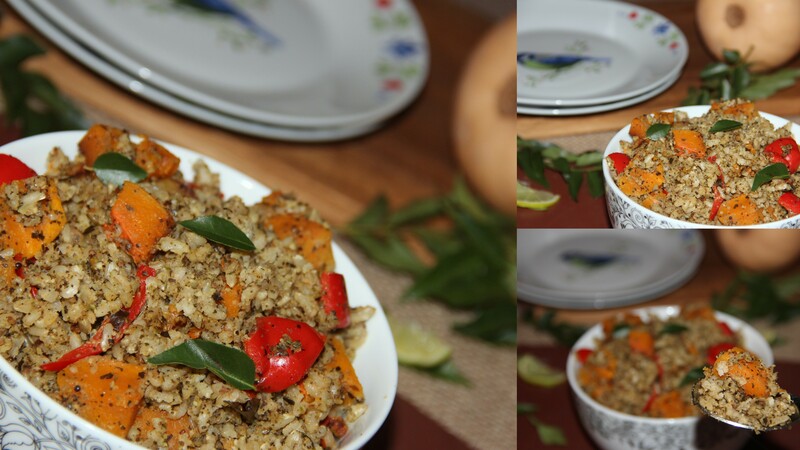 In a pan add cashew nuts, cumin seeds, chillies, pepper corns, garlic and roast for a minute or two. Add curry leasves and saute for 3-4minutes or untul slightly changes its colour. Turn off the flame and let it cool a bit and then blend it to a coarse powder, set aside. Heat oil in a sauce pan add mustard seeds, as it pops, add urad dal, channa dal and saute for few seconds. Add diced squash and cook until nearly (3/4th done), then add diced bell peppers and continue to saute for another 4-5 minutes. Add cooked rice, ground curry leaves powder, salt and mix well. Cook until the rice coats well and is heated through. Turn off the flame, stir in lemon juice. Can substitute brown rice with white basmati rice/any rice of choice. Curry leaves powder can be made ahead and stored in the refrigerator in an air-tight container. Posted on March 1, 2015, in Indian, Main dish. Bookmark the permalink. 25 Comments. Thank you so much for reblog…. It looks delicious! Great colors in this dish. Looks cool Chitra…Guess it would taste a bit sweet…. I am not familiar with curry leaves – I need to see if I can find any 🙂 Great recipe as I am looking for more ways to add squash to my diet. I love all the flavors you have going on in this rice, Chitra! I was wondering, do you know if the powdered curry also has all of these benefits? I was just wondering. I will have to see if I can find some curry leaves here. I need to research if there is an Indian grocery store where we live. Thanks for sharing this yummy recipe! Shari – People do use dried powdered curry leaves where fresh is unavailable. So you can give it a try since fresh leaves are not available at all places….Benefits logically should be retained however fresh leaves flavour will be missed using dried leaves. If one is using the leaves for the first time will not notice the difference in flavour so give dry leaves if avaiable….